As I've said elsewhere, US superhero comics are not my medium of choice. I have no emotional attachment to them and are blissfully unaware of the comings and goings of DC and Marvel beyond the bare minimum of what is absolutely required so as not to be persecuted by Nerd Culture. So frankly, I couldn't give a neutrino's emission about how Batman stacks up as a comic book movie: Comics and comic culture are entirely peripheral to what this movie is and what it did. 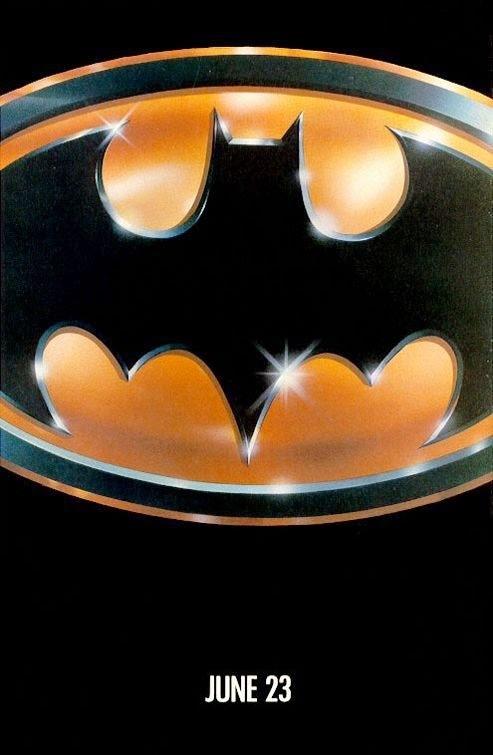 This was a legitimate pop culture phenomenon with viral marketing and everything and remains a cultural touchstone for generations of filmgoers regardless of the frequency of their patronage of comic shops because, difficult as it seems for some to comprehend, statistically everybody knows who friggin' Batman is. Indeed, superheroes and Star Trek both are among those bits of pop storytelling that are so ubiquitous and recognised they become universally acknowledged as representatives of the modern Western tradition around the world in spite of Nerds' incessant attempts to pretend they're marginal and niche. I did see this movie, though. Although I certainly knew who Batman was and picked up just through the osmosis of living in society that that he was a major part of our culture, because I didn't read any superhero comics I wasn't familiar with any actual Batman stories. I even distinctly remember my grandmother buying me a Kenner Batman figure based on Michael Keaton's portrayal in this film (Batman was no more or less toyetic a thing than Star Wars, let's all remember): She gave it to me when she met my mother and I at a McDonalds for lunch one day. It was probably the first bit of superhero merchandise I ever owned, although I think the memory of getting that toy predates even my memory of watching the movie itself. Indeed, many years later the film became a bit of a shared experience for us as we bonded over a rerun of it on one of the HD movie channels she gets as part of her cable package. Speaking of, this movie might have been my first exposure to Batman as an actual media artefact rather than bit of folkloric pop culture: I can't distinctly recall whether I saw this movie, the Super Friends or the New Scooby-Doo Movies episodes with Batman and Robin first. I'm leaning towards this though, if for no other reason than Michael Keaton's all black body armour with the bright yellow bat insignia on his chest remains the definitive Batman look for me to this day. Last summer as of this writing I was even pleasantly surprised to see the actual bat suit used in the movie on display at a weapons and armour exhibit at an art museum in Massachusetts I visited: I won't pretend it wasn't a little fulfilling to see it in person. So it's not like this movie was somehow “proving” how big populist entertainment based on superheroes could be successful and comparatively intelligent: Not in a world where the Christopher Reeve Superman movies were over a decade old and there were fond memories of the Wonder Woman and (yes) 1960s Batman TV shows. And say what you will about Hanna Barbera's Super Friends, bear in mind a lot of the people going to see this movie probably grew up on it. It's not so much, I don't think, that audiences weren't prepared for a “dark, mature” version of Batman such that the unparalleled genius of Tim Burton blew their minds: Burton is a creator who, among other things, probably gets a bit too much credit as an auteur for his work here and who is furthermore nowhere near as “dark”, “surreal” and “mysterious” a visionary as he is frequently lauded as being. Burton was far from the first person to remember that German Expressionism was a thing that existed and that you could blend it with big populist things to convey some interesting stuff it'd be hard to do at that scale and within those structural constraints otherwise: The old Universal Horror movies of the 1930s and 1940s basically did the same thing, after all. Hell, even *actual German Expressionist* works were capable of it-Remember Metropolis? Tim Burton's major innovation is that he remembered you could take that approach and apply it to things that hold appeal for multiple demographics, including children, not that anyone wants to admit Tim Burton is predominantly a purveyor of children's literature, of course (although he's not the first person to do even that, as Joe Ruby and Ken Spears did the same thing with Scooby-Doo, Where Are You! way back in 1969). And if you actually sit down to piece out what Batman actually is, it reveals its heritage pretty clearly: It's got a fairly straightforward pulp structure with enough twists and turns to keep it compelling and enough dark, antiheroic brooding to appeal to both modern sensibilities and to resonate with comic fans who grew up during the Bronze Age. And, just like Moroder's Metropolis, Miami Vice and Dirty Pair: The Motion Picture, it tries to convey itself as much through striking visuals and music, in particular pop music, as it does anything else, though it does make the perhaps regrettable choice to go with Prince as its primary troubadour when the film's regular score was more than enough to keep us hooked. In essence, this is precisely the sort of Batman movie you would expect to see in 1989. But it's not the structure itself that's the most noteworthy thing about Batman so much as it is the fact it applies this structure to a pre-existing massively popular pop culture franchise. And here the point of comparison isn't something like Dirty Pair: The Motion Picture, the existence of which is nothing if not a fluke given I highly doubt Dirty Pair is as ubiquitous in Japan as Batman is in the West (or Japan, for that matter). And anyway, no matter how good he may be at aesthetic design, Tim Burton cannot hope to compete with an animator the likes of Kōji Morimoto. No, the real comparison really is with Star Trek V: The Final Frontier: Simply by virtue of the fact Star Trek: The Next Generation exists, even though it may not quite yet be the massive runaway smash hit it will become (though it's getting there) means that Star Trek is unquestionably one of the hottest properties of 1989, and the legacy of the Original Series has long since cemented the franchise's pop culture legacy. William Shatner or no, Star Trek V *should* have been playing on Batman's level simply by coming out the same summer: We've reached the point where the visual aesthetic of the Long 1980s has become so commonplace and accepted that you can make Batman movies with it, and there is absolutely no reason why you couldn't make Star Trek movies with it as well. Except there is one, of course: The Star Trek creative team circa 1989 is incestuously insular and hopelessly behind the times. The world has lept into the Long 1980s with rapturous wonderment and Star Trek is pulling against itself trying to make the transition. The Star Trek that bears the future is being hamstrung and neglected while the zombified shadow of its predecessor claws desperately for relevance. There's no better testament to Batman's success as a work of transcendental aesthetic power and Star Trek V's failure at the first gate then the fact the NES game based on Batman is considered a classic while Star Trek V: The Final Frontier...is Star Trek V: The Final Frontier. As is the way of all things, for Star Trek to adapt and survive in this new world, it must evolve. I'm one of those people to whom Batman will always mean Kevin Conroy. I was still wearing diapers when this came out, so I never got around to seeing it until both I and pop culture in general were the wrong age for it. The Prince soundtrack is hardly the only reason it's dated. But you really can't deny what a big artifact of Soda Pop Art it is. It really doesn't need to be said (though people continue to say it anyway - it's half the point of the movie "Birdman," a film with as firm a rectal gaze as any I've ever seen. A bit TOO inside baseball, that one). I remember going to see this being an absolutely major event for myself and our little group of tow other friends. I wasn't I don't think a mayor reader of Batman comic books, though I had dipped into a tiny amount of Marvel and DC, but generally superhero comics bored me and I was more interested in experimental works. As a massive pop art event it was brilliant to go to see in the cinema, especially being there with not only my friends, but the entire audience. That was exciting indeed. Despite loving the movie in a lot of ways, I remember being vaguely disappointed as the choice to have Prince's music as part of the soundtrack really got in the way for me. The main thing I loved though were the aesthetics of the movie and over time, looking back at the film I love that Tim Burton did manage to create a cinema fusion of expressionism and pop art for mass audiences and I agree that he's not as much the auteur as he is made out to be. Nowadays my favourite films by him are things like Ed Wood which is a love story to a certain period of cinema and Big Fish which is one of my favourite films about storytelling. It's true: What more can be said about Tim Burton's Batman? Frank Miller laid the groundwork, but this film was the massive cultural touchstone that defines the possibilities of Batman today. Every cinematic pop culture take on Batman is a reaction to this film. The only innovation I could see was Nolan's sudden embrace of mythic and symbolic storytelling in Dark Knight Rises. But that's another blog. What is most interesting is to compare Batman and Star Trek V. Some of my favourite moments on your blog is when you make an interpretive point about an episode or film that I've never thought of before, but after reading it appears obviously sensible. One of those was when you articulated how Star Trek V is basically a bog-standard TOS story with a longer running time and a bigger budget. There were little intrusions of the innovations of TNG, particularly Klingon Captain Klaa, who was basically a TNG Klingon amped up for the confrontational Federation-Klingon relationship of TOS. But the storyline was utterly traditional, an example of the worst impulses of the show to dismiss pagan or mystical gods as malevolent aliens (ex. Triskelion, The Apple). Ironic, since Sybok was originally inspired by the cultishness of Christian televangelists. Burton's Batman similarly returned to original aspects of Batman for its inspiration, but in this case, the first Batman comics were very innovative: dark, violent stories told with surreal cartoonish elements. It was something like German Expressionism injected with multicoloured nightmares. Frank Miller resuscitated that style in his own stories during the 1980s, incorporating it into the Long 80s cynical approach to realism. Miller and Burton were actually innovators in returning Batman to his roots, as the camp of the Adam West show and the Comics Code era material had completely defanged Batman's style of any viscerality. Star Trek V reached back to its foundational tone of camp and its condescending Western ethnocentric fable narratives to create an utterly retrograde and disappointing movie that influenced no one because it had nothing creative left to say. It was even more disappointing because it contrasted with TNG's innovative new approach to Star Trek narratives and styles. Batman reached back to its foundational tone of dark surreality to overcome its camp image to create a pop culture masterpiece. I was four in 1989, which means I was cognizant of '89 Bat-Mania but not really ensconced in it. There was just no time for anything that wasn't teenaged, mutated, terrapin and undoubtedly a shadow warrior. (My cultural baptism was six parts punk movement) But of course Batman was in the cultural lexicon and there was a span between Batman '89 and Batman Returns where obviously it ominously loomed like a shadow over all young developing lads. For me Batman is Batman because of The Animated Series, which I devoured after school every day (and discovered on my own). But I certainly already "knew Batman". I'd seen the Burton films, I'd seen the Sixties show, the Scooby team-ups, the old cartoons. When I finally got around to tracking down a VHS of Batman (I believe I rented it from a grocery store video rental ... that was a thing once, right?) I'd probably seen Returns more than once. It was a little bit scary, a little bit campy, and had Prince music spiking its way through the Elfman soundtrack. I loved it. Tim Burton's Batman ... hell, Tim Burton's entire filmography ... is the perfect world for a dour little nonconformist and junior artist to watch and rewatch. I can't even bare to watch it nowadays. I grimace when I see Burtonisms because Burton never made an effort to evolve, adapt or move past them, seeing them as tried and true. That and I've dated a few too many girls with a bit of an obsession. But my Batman fandom is stronger than ever ... so well done, DC, Warner Brothers and Tim Burton, for releasing these when I was a little sponge. I was eight when this came out, and it left very little impression. I liked the sequel a lot more. But for me the definitive Batman is roughly equal parts Adam West and Kevin Conroy--the former is the Batman of my childhood, the latter the Batman of my teens. Hope you'll forgive the bit of self-promotion, but this is too appropriate a post to not do it: I'm starting a psychochronogaphy of the DC Animated Universe (that is, Batman the Animated Series and the shows with which it shares a continuity) February 1. I've already written the first dozen or so articles (including one on this movie) and anyone who donates $2 or more per month at my Patreon gets to see them as I write them. I remember my parents had his on VHS when I was a kid, and it was a point of obsession for me throughout, a combination of their steadfast refusal to let me watch any of the live action Bat-flicks and my having received a set of the Topps trading cards based on the film as one of a couple gifts after having ear tubes put in, providing a tantalizing glimpse. I came up on BTAS (and Kevin Conroy remains my definite Batman, for whatever that's worth now), and made a beeline for '89 once I turned 13 and was officially allowed to see it. It left an impression, and I love it still today. It's interesting how you can see in this movie, both as a film and cultural phenomenon, the seeds of the superhero film industrial complex in which we currently live. Burton knew not what we wrought. I was a little too old for this in that my image of Batman came from 60s Batman TV and the Superfriends and this Batman was a little too dark for me.